Find Muti Million Dollar Homes for Sale & Mega Mansion Real Estate Listings. Search the Central Florida MLS to view Multi Million Dollar Home pictures, prices, values and market information. 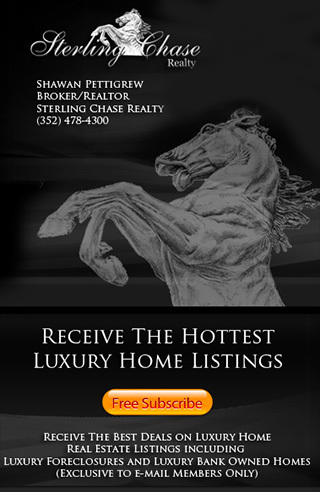 Sterling Chase Realty is Central Florida's premier Luxury Homes and Real Estate company. Sterling Chase Realty provides professional real estate services throughout the Orlando area's finest Luxury Communities. If you are considering moving to this beautiful area and would like to know more about buying a Multi Million Dollar Home or Mega Mansions for Sale. Please contact Daniel Pettigrew at (352) 404-4622.